some extra fun to your next birthday party or event. 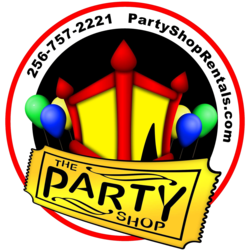 We have the largest inventory of inflatables for rent in the Shoals Alabama area! We pride ourselves on providing superior customer service and offer Church & School discounts. Because we have over 15 years of experience, we are fully equipped to handle any event, large or small. We will deliver, set up, and take down all rental equipment, so your event will be a hit without you having to stress! How late can I keep my rental? ONE day rentals are for *up to* 10 hours, but MUST be picked up by dark. Rentals over 10 hours count as Two Day rentals and may incur an additional fee. We deliver rentals over $125 for FREE in the Shoals area up to 20 miles from our warehouse in Killen. For distances OVER 20 miles (up to 40 miles) we will deliver for a small fee. Do you supply power for inflatables? No, the customer is responsible for supplying adequate power for inflatables. We require access to standard 110 outlet(s) for 3 prong plugs. We may need access to more than one breaker for multiple units or units requiring more than one blower. All inflatable units must be placed 75 feet or less from power outlets. Can I keep my rental an extra day? Although our rentals are based on one day (up to 10 hours), we offer a discount for additional consecutive days. Rent one day, and get the second consecutive day 1/2 price! BOGO also may apply to rentals kept over night OR over 10 hours in one day. What should I do to prepare for my inflatable rental delivery? Congratulations on your big event! To help you make the very most of your inflatable rental, we recommend doing a little prep work before we arrive. First, make sure you know where you want us to put the inflatable and that the space is large enough to accommodate not only the unit, but also the stakes we will use for safety. For large units set up outside, we MUST be able to drive directly to the set up location. If we are unable to drive to the set up location, an additional fee may be charged per unit. Second, if you plan to mow the lawn prior to the event (if you don't have a bagged mower), we recommend mowing 2 or more days prior instead of day before or day of the event. This will keep grass clippings out of your inflatable and will help keeps kids cleaner, also! Check the area and remove toys, sharp objects of any kind, pet droppings, etc. before we arrive. And you may want to eliminate any fire ant mounds in the area as a favor to your guests! Power: We will need to set up 75 feet or less from your power outlet(s) - standard 110 with 3 prong outlet. For water units, your water hose should reach our inflatable. Do you have a CHURCH or SCHOOL discount? These codes are for churches and schools ONLY. Individuals attempting to use these codes may have their events cancelled without notice.